Absolute HCBS works with our members to ensure they are receiving the necessary care and support through our HCBS services in Arizona. Learn more! How Do I Request Care? 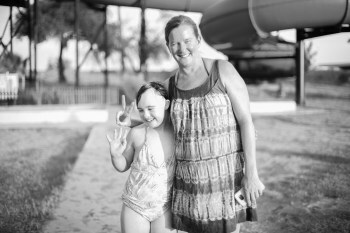 Our focus is finding the provider that is the right fit for your family. 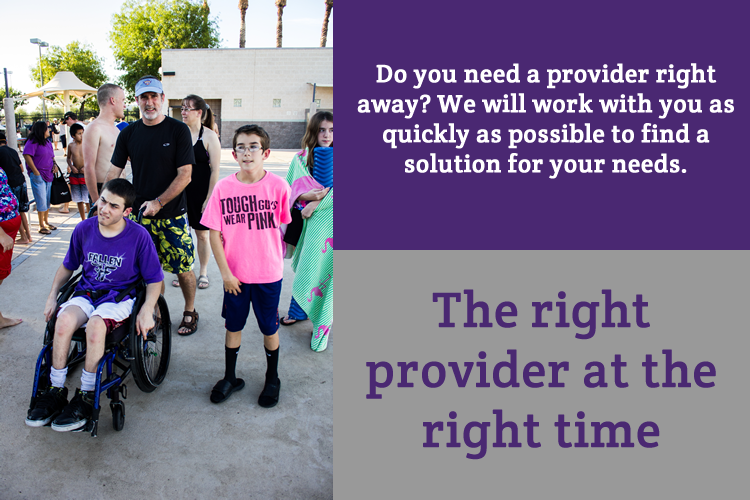 We can provide guidance through working with the state to get support approved, and we will work to learn more about your family and your specific needs to match the right provider to your home. If you have a family member or friend who is interested in becoming a provider for your family, we will work to ensure they meet all the requirements. Our priority is placing a provider in your home quickly, and we are known in the industry for our response time. We will always return a phone call by the next business day, and our goal is to have a provider in your home within three weeks. Contact one of our area managers, or any of our office team, today and we can begin the process of getting care placed in your home. WHAT IF I’M DESPERATE FOR A PROVIDER? Contact us today and we will work with you as quickly as possible. There are few things more personal than letting someone into your home to provide care to your family, and we understand that. We work to make sure you are comfortable every step of the way. You will have an opportunity to meet with available providers, ask questions, and select a provider that is the right fit for your family. We will be your partner in educating the provider about your home and your lifestyle. 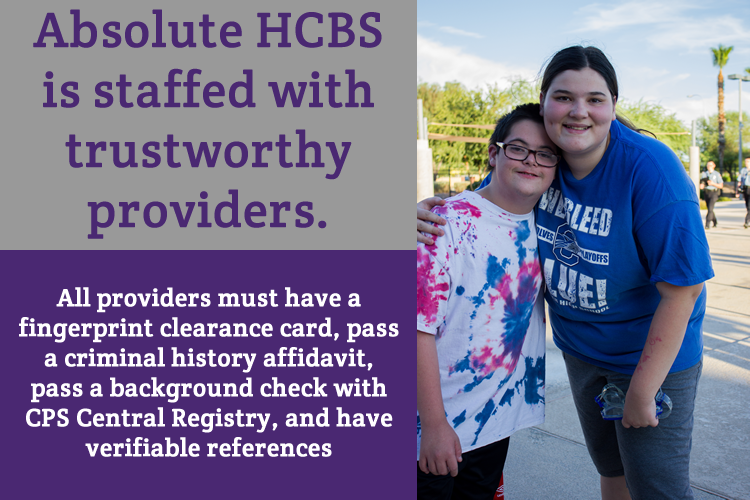 All Providers must have a Fingerprint Clearance Card, pass a Criminal History Affidavit, pass a background check with CPS Central Registry, and have three verifiable references. It is important to us that you trust the provider you are letting into your home. The interview process is a great opportunity for you to meet with and learn more about potential providers. When interviewing a potential provider, you may ask any question you want including those that Absolute is prohibited by law to ask. Please keep in mind just because you can does not mean you should. Determine what attributes and character traits you feel are necessary to be a quality provider. These might include: honesty, integrity and reliability. Consider a provider who is professional, punctual, caring, and patient. You may vote differently, have different religious beliefs or lifestyles, or support different charities than your potential provider but those may not be the critical factors in finding someone who will best serve your family. Your company does such a great job for employees. So organized and professional! Really terrific. Family is not an important thing. It's everything!